The above info came from Spazzter, and was edited by yours truly (contact me). The image came from ANIDB.net. Tomokazu Mikuri is your average high-school boy - an admitted pervert with no girlfriends and terrible grades in school. On the eve of his 16th birthday, before going to bed, he wishes something extraordinary to happen in his life. He then dreams that he is inside a strange world with floating cubes and other geometrical shapes surrounding him. Suddenly, a mysterious flying girl soars past him, pursued by an oval-shaped mechanical monster firing beams at the girl. The girl puts up a fight but is hit and plummets down to the ground. Tomokazu rushes in to catch the falling girl and when he touches her a bright light suddenly flashes...the young girl revives and is seemed to be energized or powered-up. She battles the monster again and this time is victorious. Tomokazu wakes up the next morning and couldn't help wondering how realistic his dream was...until he finds the very same young girl in his dream lying next to him!! 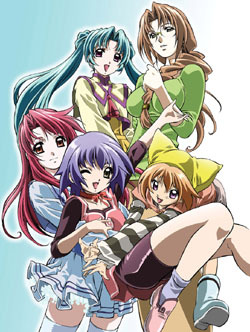 Thus begins Tomokazu's mysterious destiny in the dream world (called Moera), its link to the fate of the real world, and how five girls will help him to fulfill that destiny. This is Yumeria! The above description came from Spazzter, and was edited by yours truly (contact me). This starts with a dream. Hence the name "Yumeria" (Yume is Japanese for dream). Our character is Mikuri Tomokazu, a 16 year old boy, who, on his 16th birthday, is sucked up into his dream. He is of the Mikuri bloodline, which has the power to go against the fate of future, and do things by his will. While in his dream, Tomokazu meets Mone, a mysterious girl who can only say the word "Mone". When he awakens, he finds Mone right next him, in reality. The above description came from shinodadragon@hotmail.com, and was edited by yours truly (contact me).